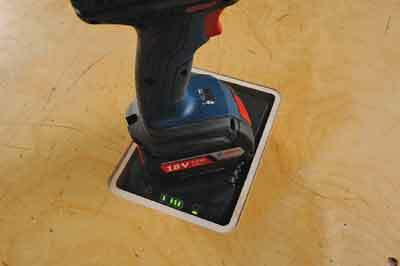 The charger frame can be screwed to any convenient surface - even vertically, although Bosch may not approve! Months ago, I had the opportunity, along with a lot of other members of the trade and retail press, to look at and try out the all new yet-to-be-launched Bosch wireless charging system. Finally, it is ready to buy 'off the shelf', is it worth the hype? 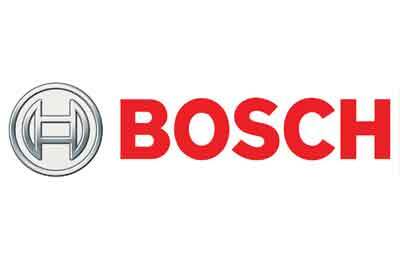 First off, I have to say that Bosch have made something quite technical and innovative look dead easy, which is almost a mistake, if it is such a leap forward in technological progress. In fact, the pioneering genius Nikola Tesla proposed the idea of wireless electricity transmission at the end of the 19th century, but his plans failed due to the parlous state of his finances and finally came crashing down with the demolition of the Wardenclyffe Tower, New York, which had been intended to demonstrate mass electricity transfer. So, how does that help us? Bosch have a number of options for using the system now and in the future. First off, the tool in question just sits on the charger between uses and recharges - no wires, no battery changeovers, or dead batteries - as the tool is always returned to the charger. 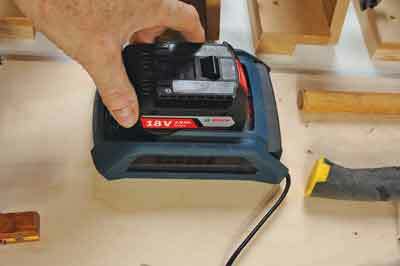 The charger comes in a frame that can fix to a surface, including a wall, this holds the tool on the charger correctly no matter what shape, weight or balance the tool is. 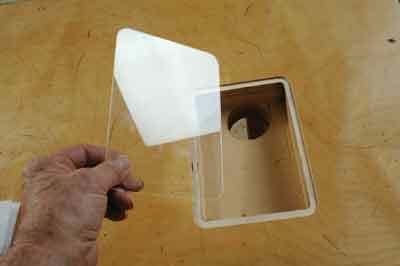 The charger can even be put under a plastic plate in a work surface, which is ideal for production line assembly work on a big or small scale. 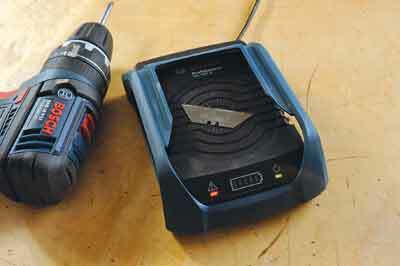 Use it, return it, use it, return it - the tool will always be charged and ready to go. In the future there will also be a vehicle mounted option. 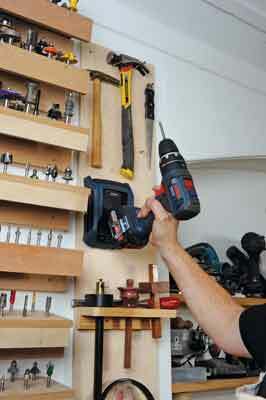 Imagine being a tradesman arriving on site and never needing to worry about the charge state of your tools. Overnight and while driving to site the batteries are constantly being monitored and charged. Sounds great, but what special tools does it fit? 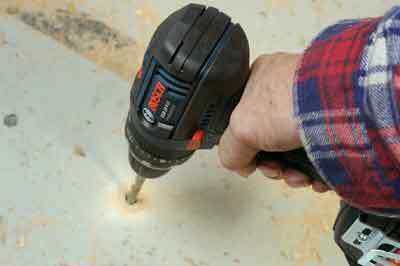 Answer... none, because all Bosch's lithium-ion range of 18V power tools from their inception in 2003 are compatible. All you need is a special 2Ah Li-ion inductive charging battery and the charger itself. 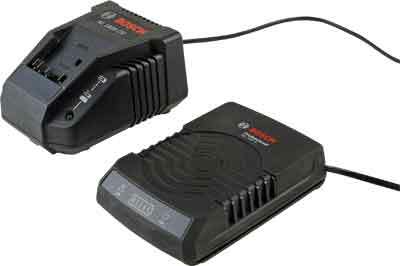 So, this is a true retro fit charging system and a great adjunct to your existing kit. Cost-wise it is good value, so upgrading to fit and forget wireless charging won't dent your bank account. 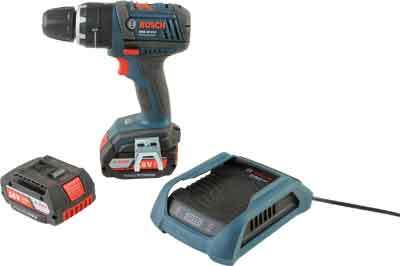 This new and deceptively simple piece of kit will be of interest if you are already a Bosch trade user or are thinking of buying a Bosch combi-drill. In the future, there will be different kit combinations available and possibly a battery and charger add-on kit. It will change your working habits - or will it? It really depends on what you do and how it fits in with the way you work. It seems to me that for bench assembly work or turning up at a job, with a van-based charging option hopefully available in the future, it could prove a godsend. The 2.0Ah battery seems small for some tasks, but two batteries come in the kit and the whole idea is that you return the tool to the charger between uses to top up the battery. We haven't had long to work with it ourselves, but I'm sure both Bosch and ourselves would be interested in getting your feedback if you are an early adopter. So do keep us in the 'inductive loop'!